Earlier this week I published the topology for CCNP TSHOOT built in GNS3 but for some reason the attachments didn’t work so I had to move the article, you can find it right here. It’s a good idea to spend some time looking at this topology and its configuration. See why things are working and the way they were designed. I’ll be uploading different labs with troubleshooting tickets later for you. Ik probeer de GNS3 TSHOOT Labs te downloaden. You asked for http://gns3vault.com/false, but despite our computers looking very hard, we could not find it. What happened ? Is de download misschien niet meer beschikbaar? The topology is excellent !!! This is going to be a great way to practice for the CCNP TSHOOT exam. By the way, i didn’t find the network 10.2.4.12/30 configuration in DSW1 and DSW2. I also realize that to keep the VLAN configuration in DSW1 and DSW2 it’s necessary the check the box “save nvrams and virtual hard drives” in save project as… otherwise the VLAN configuration is lost. This is a good topology to learn from. When I trained for the TSHOOT test, I used GNS3 plus 2-3560 (DSW1 & DSW2) and 2-3550 (ASW1 & ASW2) to create the Lab. If you can build this Lab from the topology they give you, passing should not be a problem. This is why you should take TSHOOT last. having the real switches is awesome because you can also troubleshoot spanning-tree, trunks and etherchannels. Did you pass the TSHOOT exam? I’m looking for some input to build labs so if you have some input I would love to hear that. I was wondering would it be possible to start a thread on this website were user’s who have downloaded the TSHOOT lab(or any of the other final configs) could break the Network and upload the broken configs for other users to troubleshoot. And maybe users might include real-world problems they have encountered. I am currently studying for TSHOOT and am finding that there is no book that can teach you how to Tshoot. And only time spent on broken Network’s can!!!!!!! Sorry for the late response, busy times. Yes, I did pass TSHOOT and I am CCNP now, it’s the only Cisco test I ever got 1000 on. It is a real easy test if you have an idea of what you are looking for, and built the lab from scratch. For IPv6 on the 3640s, add an Ethernet module (NM-1FE-TX or NM-4E) to R1, R2 and R3. This will help with the IPv6 issue. The Ethernet module adds a unique MAC address to each router. I use the 3725s with 12.4, no issues there. Thanks for your comments. The Ethernet Module for IPv6 is a good idea…didn’t know that before! Grats on your CCNP! 8) Time for another Cisco track or time for something else? Debating on finishing CCIP (just need QoS) or start CCNA:Voice. I took the BPG+MPLS exam just after I passed TSHOOT. 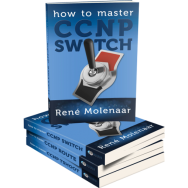 I have purchased your master ccnp ebook.I love it. great job!! I was wondering when the master ccnp switch wll be out.I’m taking the tshoot in 3 weeks. Please elaborate. What is your issue?